Men’s soccer treated its returning alumni to a victorious Homecoming match on Saturday as Tufts beat No. 16 Amherst for the first time since 2005 in a decisive 3-0 victory. The Jumbos returned to Bello Field on Sunday to face the Hamilton Continentals, who currently top the NESCAC, and came away with a 2-2 tie. Tufts’ record stood at 2-1-1 in NESCAC play heading into the game against Hamilton on Sunday, and the Jumbos got off to a great start against the Continentals. Tufts scored in the fifth minute of the contest when senior co-captain midfielder Zach Halliday sent a ball sailing over players’ heads to his brother, junior midfielder Kevin Halliday, who was able to send a cross into the box that senior midfielder Kevin Lawson drilled into the back of the net. Lawson came close to tallying another goal minutes later, this time aiming for the bottom right corner, but Hamilton’s senior goalkeeper Harris Pollack was able to make a diving save. Five minutes after Tufts went up by one, Hamilton answered, catching the Tufts defense on its back foot. Continentals senior midfielder Mike Lubelczyk buried a shot in the bottom left corner from 35 yards out. Junior goalkeeper Bruce Johnson’s attempt to save it was very close, but the wet conditions on the turf field helped the ball reach the net much faster than he could anticipate. The equalizer did not slow the Jumbos down, though, as they continued to fire shot after shot on the Continentals’ goal. First-year midfielder/defender Zachary Trevorrow had a shot clang off the left post and a follow-up shot that went slightly wide, while Kevin Halliday also had an attempt on goal. In the 17th minute, the Jumbos were awarded a free kick in a threatening position just outside the goalie box. Kevin Halliday placed the ball perfectly in the box, and after some bouncing around, Sullivan managed to get a head on it, putting the Jumbos back in the lead. Once again, the Continentals refused to go down without a fight. Continentals senior midfielder Alec Talsania kicked a shot straight at Johnson and it rebounded to his teammate, first-year defender Luke Eckels, who managed to shoot the ball through several defenders and past Johnson. The score remained 2-2 for the rest of regular time, and despite two overtimes, neither team was able to finish their chances. At the end of the game, the Hamilton bench seemed happy to come away with a tie, but for Tufts it was disappointing to have given up two leads. Saturday was a different story for Tufts. No. 16 Amherst is the reigning NCAA Div. III champion and Tufts had not defeated them in over ten years — even during its own NCAA championship season in 2014. Tufts had to focus on Amherst’s attacking unit, as its height and physicality was difficult to defend. Amherst senior midfielder Andrew Orozco, who is 6’6″, attempted two header shots within the first 15 minutes. But the combined forces of Najjar, who stands at 6’5″, and Braun, 6’4″, managed to keep Orozco under control for the remainder of the game. In the 17th minute, senior forward Gaston Becherano, Tufts’ top scorer this season, was able to put the rebound from Zach Halliday’s shot into the goal. Just 14 minutes later, junior defender Matt Zinner scored an unassisted goal on a shot on the bottom left corner, beating Amherst junior goalie Lee Owen. Zinner was making his return from a 10-day injury hiatus, and his presence as a starting defender helped bolster the back with both skill and experience. In the second half, senior co-captain Nate Majumder made his return to the field after being sidelined for the past six weeks with a concussion. With five minutes left in the game and the Jumbos up 2-0, first-year midfielder/forward Gavin Tasker sent the ball to Majumder who scored his first goal of the season in the 85th minute. Majumder, who was the NESCAC’s second highest scorer last season with 11 goals, is excited to get back onto the field with his team. 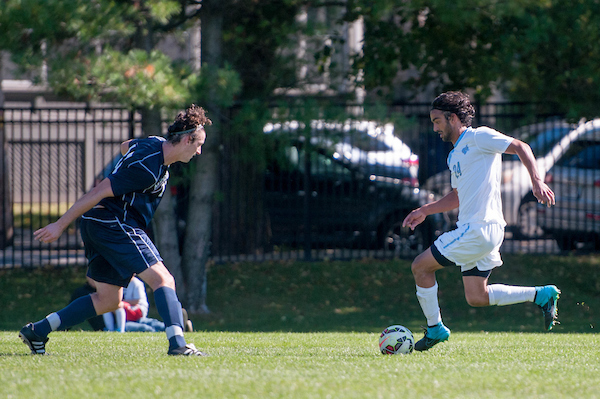 The weekend was a strong contrast to the Jumbos’ 1-0 loss to a last-place in the NESCAC Wesleyan team on Sept. 27. Tufts’ main goal now is to establish consistency going into the second half of the season and take the season game by game rather than look to the NESCAC or NCAA tournaments. The Jumbos look ahead to Saturday when they will travel to face the Middlebury Panthers, who are currently second in the NESCAC with a 3-0-2 conference record and a 6-0-2 overall record. Middlebury is the only team in the conference that has not yet lost a game, but with Tufts playing well against two of the other top teams in the NESCAC, the matchup will likely be a tough battle for both teams.